6 Affordable Japanese Buffets So You Can Gorge On Fresh Sashimi! With free flow of fresh sashimi and more, who can resist Japanese buffets? Though some restaurants at hotels charge exorbitant prices for a buffet, we’ve found 6 places where you don’t need to spend a bomb. 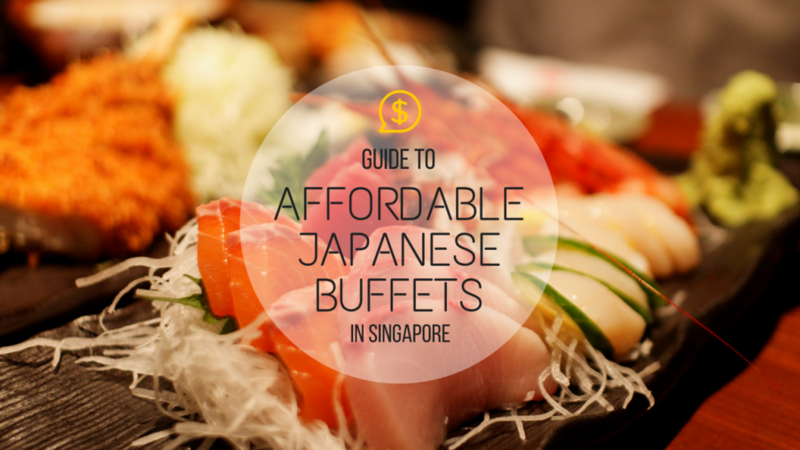 Here’s our list of affordable and good Japanese buffets to indulge in. At the same time, you don’t have to burn a hole in your pockets! Tucked away at a corner of UE Square’s Level 3, Shin Minori offers high quality Japanese buffet at an affordable price. Diners can enjoy their meal watching sushi chefs prepare sashimi and sushi while sitting at an open sushi bar. Alternatively, opt for a window seat with views to Robertson Quay area. There’s a wide range of fresh sashimi, sushi, maki, yakitori, teppanyaki and many more. If you are looking for a private gathering with some privacy, call them to book their private rooms. They have 2 adjourning table sitting rooms which can accomodate 12 pax in each room and also a tatami room that can sit a total of 12 pax for a cosy setting. With many positive reviews from customers, Irodori Japanese Restaurant in Riverview Hotel consistently draws crowd for their fresh seafood and selection of over 100 dishes. Prepared by skilful chefs, the restaurant only uses fresh seafood from Australia, New Zealand, Norway and Europe. They serve appetisers, sashimi, sushi, teppanyaki, tempura and many more. Three private rooms that sit 8, 10 and 12 are available for your business meetings or for some private family time. Be sure to make reservations as this restaurant may be packed even on a weekday! Located just opposite Riverview Hotel lies another affordable yet delightful Japanese buffet. Ikoi Japanese Restaurant is located in the lobby of Hotel Miramar. This small and cosy restaurant keeps diners happy with an extensive selection of fresh Japanese cuisine. Simple, no-frills and usually full house, this restaurant is highly popular and recommended for its buffet. To keep customers happy while they wait for their food to be served, Ikoi serves complimentary side dishes from salmon sashimi to Japanese teapot soup. On their menu, the fresh cuts of sashimi and wide selection of tempura dishes are the most popular. It’s best to make reservations at least 1 week in advance. Be spoilt with endless servings of snowcrabs, oysters, Häagen-Daz ice cream and free-flow Sapporo Beer at Momiji! With a wide range of quality Japanese cuisine, you probably won’t be able to try every item in a single visit. You can even make your own waffles at their DIY waffle stations! The servers at Momiji are quick and attentive. Plates are cleared quickly to make room for more food. If you are looking for an intimate dining space, do book their private rooms available at their Revenue House outlet. Be sure to arrive at 6.30pm for their free-flow beer which lasts till 7.30pm! Located right in the heart of the city, yet away from the hustle and bustle, Senki serves up a wide range of dishes for its buffet menu. With many items available on their menu (138 items to be exact), it would be best to skip lunch if you are coming for dinner. Priced reasonably, the service at Senki is efficent. This is the place to go if you are looking to unwind and have an unhurried meal in the city. Hidden in a low-rise office complex in Alexandra, the restaurant is surprisingly crowded at 8pm on a weekday. Premium sashimi cuts including swordfish, yellowtail and tuna are fresh and melt in your mouth! Not only do they serve the usual sushi, maki and tempura, but diners are also able to have a shabu shabu or sukiyaki hotpot. There is also teppanyaki at their Alexandra outlet too! With such a wide variety of over 150 items, including appetizers to desserts, this is definitely a spot worth returning for more! Check out their menu here. For residents living at Yishun, Himawari has an outlet at Orchid Country Club. The restaurant is open to public and free parking is available. If you are looking to hold private functions, they have 2 tatami rooms and 1 VIP dining room available. Tempted to get your sashimi fix? Get ready for a massive feast of mouth-watering Japanese cuisine! Don’t forget to put on those stretchy pants and a loose top to hide those post buffet bellies.